I am so excited to be doing my first Style Study! 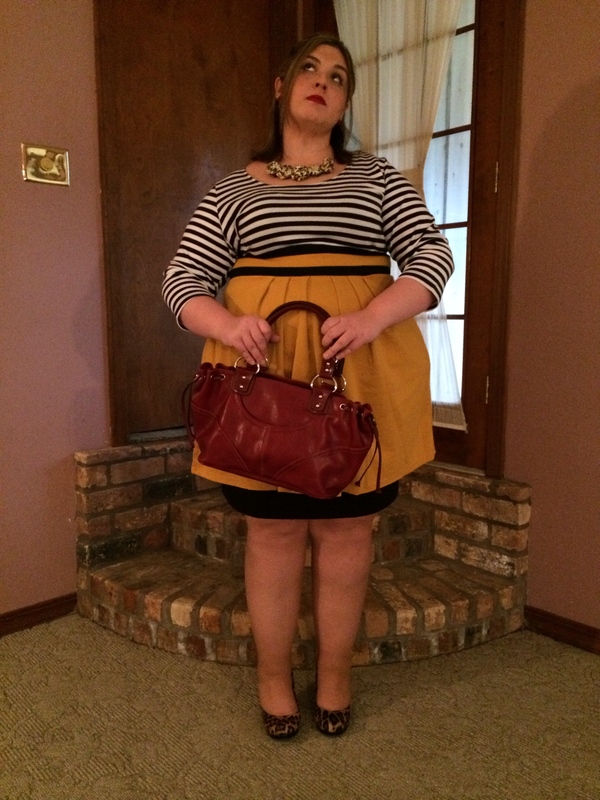 Each week I’ll share fashion tips, DIYs, and show what goes into making a great outfit. There are many more to come, so check in every Monday for a new one. Sometimes your wardrobe has to keep up with the ever-changing weather, and that has never been truer than this year. Even here in in South Louisiana, we haven’t been immune from the polar vortex along with having occasional days of unseasonably warm weather. We’ve had ice storms followed by days with temperatures up in the 70s followed by more ice storms. Not to mention, it’s that wonderful time of the year our favorite websites and stores introduce their spring and summer styles, and I don’t know about you, but I want to wear everything new NOW. I found this great dress shopping on Modcloth for the first time. I had heard of them and their cute vintage-style dresses and outfits before, but I had no idea that they had clothes in my size. Now I’m a Modcloth addict. 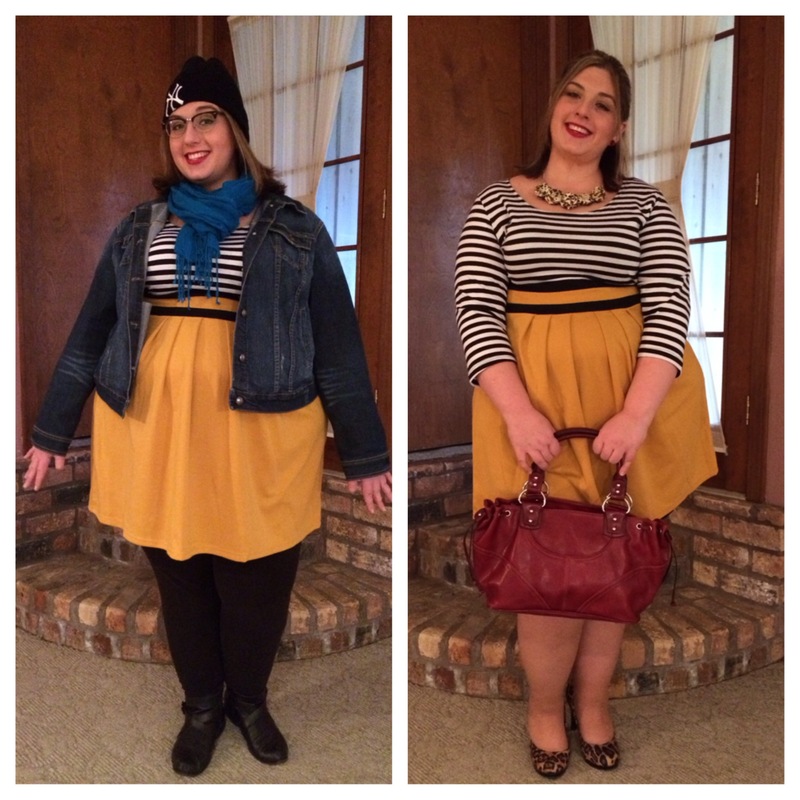 Here are two ways to wear their Literary Luncheon Dress: one way for when there’s still a chill in the air and another way for when it starts to warm up. Check out this cold-weather look. Granted, I’m not as bundled up as those of you up north would be, but this would also look great layered under a black pea coat. Leggings have been my winter uniform, and, yes, I do often wear them as pants. Don’t judge me, they’re stretchy. These are from Avenue, and they’re super comfortable. 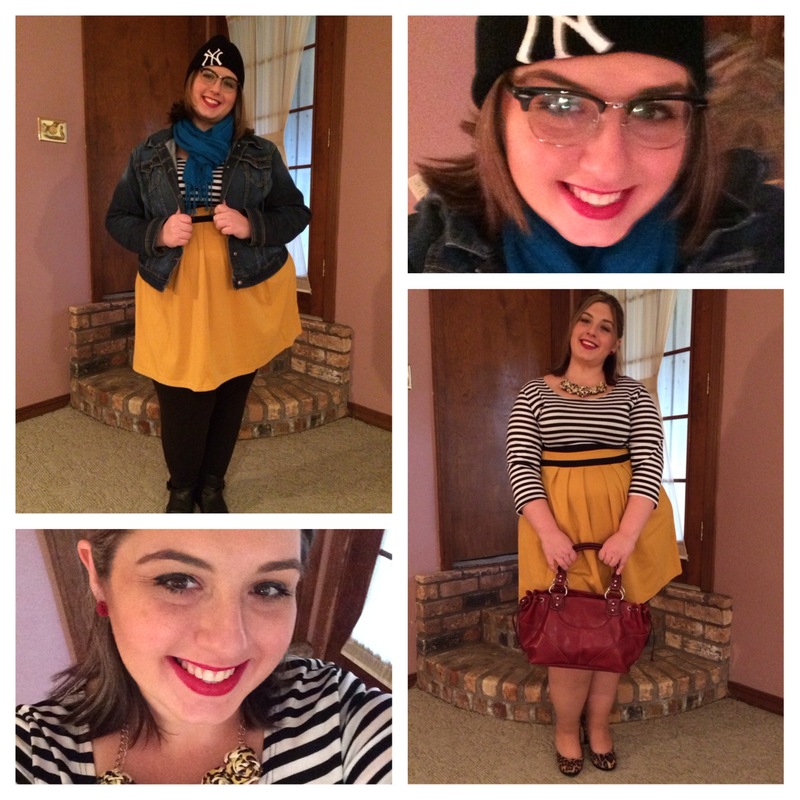 I also paired it with a denim jacket from Torrid and some black ankle boots from Jessica London. The accessories are from unlikely places. I like pairing bright colors together, especially since I’m a recovering all-black wearing fashion ninja. 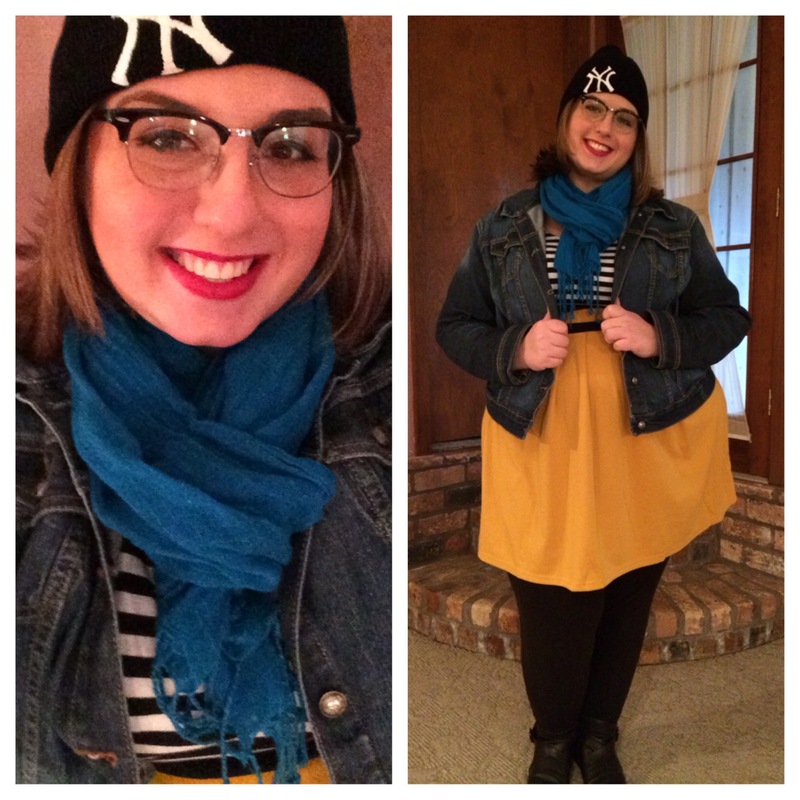 The bright blue scarf is from Walmart, which is actually a great place to grab little extras for outfits. The Yankees hat I bought on the mean streets of NYC when I was on a high school trip—not because I like baseball but because I was cold and it made me feel a little gangsta. The second look shows how this dress can transition to warmer weather. Just like I paired the mustard yellow and bright blue in the previous picture, I picked bright red accents with a purse thrifted from Goodwill and red dahlia earrings from 2nd & Charles (here’s a similar pair from Modcloth if you want to order online). 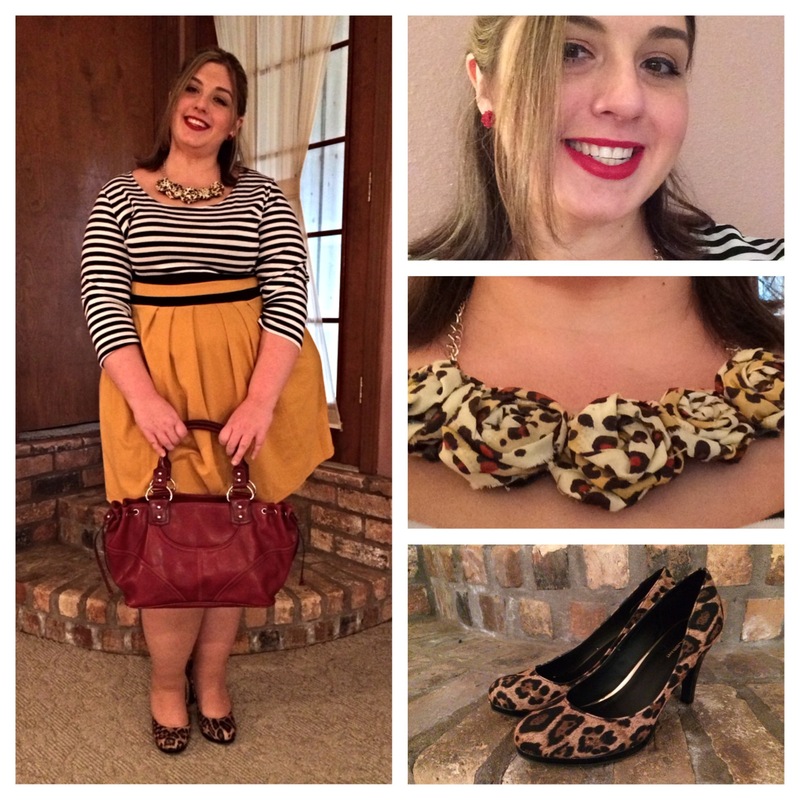 Leopard print always adds a little “spring” to my step, so I decided to accent the outfit with a pair of heels from Lane Bryant and a DIY statement necklace. I found the how-to here through Pinterest. An extra tip, I actually cut up a leopard bandana that I found from Hobby Lobby since the project didn’t require a lot of fabric. I’m personally used to skirts and dresses that are a little bit longer than this one. While there are times that I would rock this dress as is, in this photo I added a black pencil skirt from Lane Bryant beneath. I think it’s kind of cool to treat the bottom of the dress like an elongated peplum, and it’s even another option for an occasion when I’d want to be a bit more modest. There you have it! Don’t be afraid to get creative with colors and accessories. There are so many more ways to embellish a dress with a simple silhouette like this one. All you have to do is go for it and have fun!